Like many others, I use the web for many things including research, entertainment, socializing. A few years ago I went on a Traveling Geeks trip to LeWeb in Paris and met the team from Pearltrees. I started a TechMama profile on the Pearltrees web application to organize presentations, research, fun social conversations and many other categories. I enjoyed how after saving my web content into Pearltrees, I could go back and quickly browse though all the web pages (including videos). Saving the web page was as easy as using the Pearltrees add-on on my browser to “Pearl it”. I had fun organizing my curated content. For visual people like myself, Pearltrees is a great way to not only curate content but have a visual way to see and organize it. Because there are many visual curation sites that offer users the ability to save information, users should review and choose the curation tool that best fits with how they want to see and store their information. Although I use multiple curation sites, when it comes to situations where I want to see my information in a tree format (and have the ability to quickly browse through the content) – Pearltrees is a great tool. 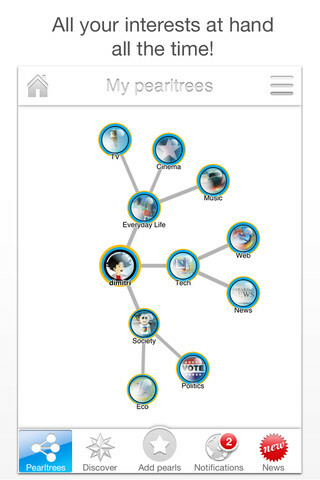 Today Pearltrees announced their new iPhone app that will allow Pearltree users to take their curation on the go (with an iPhone or an iPad). Disclosure: This post is a press update.